India and Bangladesh played out an edge of the seat thriller with both the sides treating us to an Asia Cup final truly worthy of the big stage. A nail-biting encounter that went down till the last ball of the innings, saw India become only the second side in history to win a final with 0 balls left after they successfully chased down the 223 run target set to them. 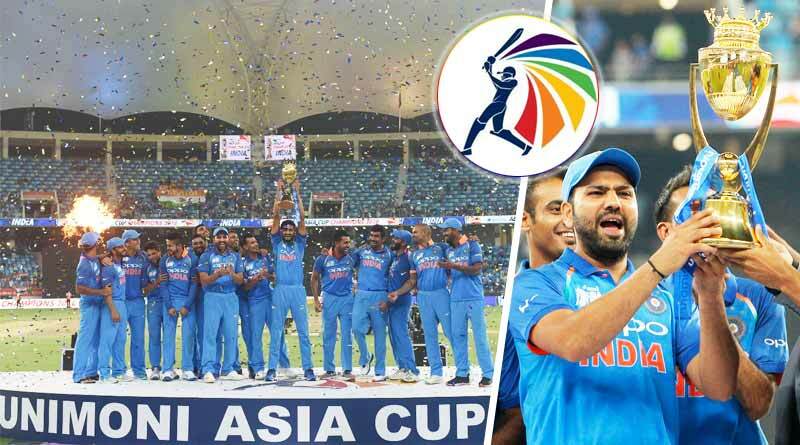 With the win, India lifted the Asia Cup for the seventh time, creating the record to win the title the most times. The match was everything we as cricket lovers could have asked it. Contrary to popular belief, India was given a real run for their money with a middle-order batting collapse seeing them limp towards a rather nominal target. In the end, the country managed to hold their nerves, to see off their noisy neighbors, one who were left ruing their early celebrations yet again. Batting first, Bangladesh got off to an attacking start that saw them reach 120 for the loss of no wickets after 20 overs. However, that was the only good spell their innings saw, with the Indian spinners working in tandem to kill off the Bangladeshis. Losing 10 wickets for a petty 102 runs, Bangladesh managed only 223, with Kuldeep Yadav and Chahal making the most of a slow wicket. Their efforts were excellently complemented by the Indian fielders who affected three run-outs on the day to wrap up Bangladesh for a below-par total. Jolted early in their endeavours with the in-form Shikhar Dhawan departing for just 15, followed by Ambati Rayadu for 2, India’s middle-order was exposed. Having rarely come into play this tournament, a relatively untested middle-order failed to step up to the occasion. Sharma’s wicket brought in Kartik and Dhoni to the crease. While the duo did manage to steady the Indian innings, their partnership came at a run-rate that piled the pressure on the batsmen to follow. Losing Jadhav to a hamstring put India in a perilous situation that saw Jadeja and Bhuvneshwar Kumar battling it out on tough batting conditions. Remarkable credit has to be given to Kumar who paid a gem of an innings. Sticking around with Jadeja, Kumar’s 21 was worth its weight in gold, an innings that edged India nearer to the total. Returning to the crease, Jadhav did enough in the final over to see India end up with the golden trophy in the hand amid fire-works and huge celebrations on-field and in the stands. News that India wins Asia Cup 2018 brought much-awaited cheers from the cricket fans. Rohit Sharma, India captain: We played some really good cricket throughout the tournament and this is the reward of hard work throughout the tournament. I have been part of games like this before and credit to the guys in the middle to handle the pressure and to cross the finishing line was a fantastic effort.